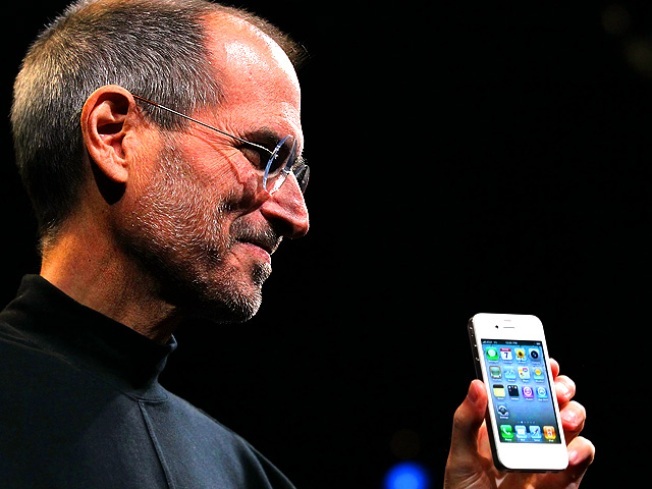 Apple CEO Steve Jobs holds the new iPhone 4 after he delivered the opening keynote address at the 2010 Apple World Wide Developers conference June 7, 2010 in San Francisco, California. Planning an iPhone 4 buying strategy for Thursday, June 24, when the phone is released? Scratch AT&T stores off your list — the exclusive carrier of the popular device said it will not have iPhone 4s available to the public until June 29. Apple will be selling "limited quantities" of the iPhone 4l at its Apple Stores on Wednesday, June 24, encouraging lines by promising phones on a first-come, first-serve basis. They may easily run out. iPhones should also be available — although perhaps in not as great a number — at Wal-Mart and Best Buy stores. AT&T said Tuesday the heavy iPhone 4 pre-orders starting on June 15 are to blame, with "unprecedented, overwhelming demand." Apple said last week that there were more than 600,000 pre-orders for iPhone 4 taken by both AT&T and Apple. The companies' Web traffic was extremely high, with some customers complaining about malfunctions in order-taking by both companies. By last Wednesday, AT&T suspended pre-orders. "It was the largest number of pre-orders Apple has ever taken in a single day and was far higher than we anticipated," Apple said then. "As we said last week, iPhone 4 pre-order sales volumes (on June 15) were 10 times higher than the first day of pre-ordering for the iPhone 3GS last year," an AT&T spokesman said Tuesday. "Because of this, we’ve made it our priority to fulfill these orders first — and we’re on track to do so beginning this week. "We want to provide iPhone 4 to as many customers as possible. We’ll start by fulfilling preorders, and follow with iPhone 4 availability for all other customers starting next week — Tuesday, June 29 — when iPhone 4 goes on sale across all AT&T sales channels." In a statement, the carrier said that the iPhone 4 will "begin arriving this week for customers who preordered," and for some that may be starting Wednesday, according to reports. AT&T said it will send a customer an e-mail when the order ships for home or business delivery. Those customers who pre-ordered the phone for pick-up in AT&T stores will receive phone calls, letting them know when they can come get the phone. For everyone else, AT&T says it plans to have iPhones "available on a first-come, first-served basis while supplies last — on June 29 in its retail locations," on the company's website and through its business sales channels. Still, there may be good reason to visit your AT&T store on June 29 — people ordering online through Apple are not promised phones before July 14. The phone, which features video calling between iPhone 4 users, costs $299 for a 32-gigabyte model with a two-year AT&T contract, and $199 for a 16 GB model.